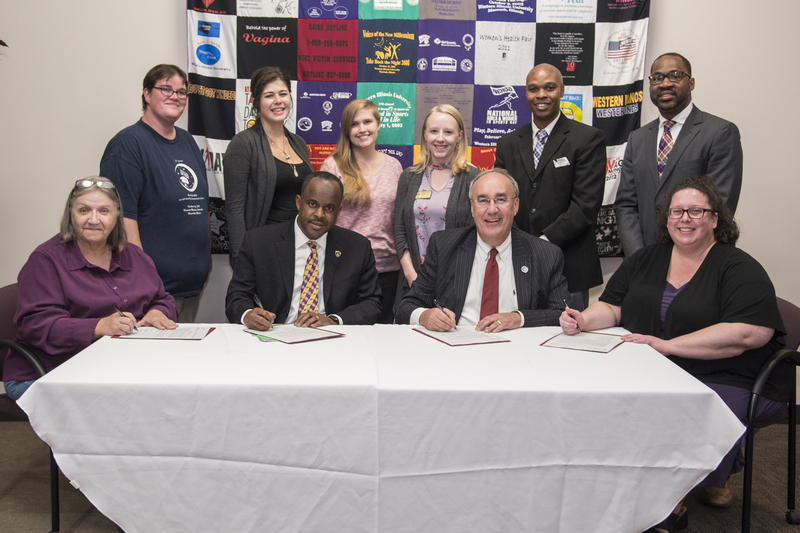 Western Illinois University President Jack Thomas and Macomb Mayor Mike Inman signed a proclamation this week marking Oct. 26 as Take Back the Night Day in Macomb. Pictured with Thomas and Inman, in the front row, are Victim Services Director Diane Mayfield and WIU Women's Center Director Stephanie Hovsepian. In the back row, from left, are Becky Cox-Medina of WIRC; senior sociology major Lindsay Gleason, of Normal, IL; graduate student Mychele Montgomery, of Big Lake, MN; graduate student Myranda Anderson, of Davis Junction, IL; WIU Associate Vice President for Student Services Jason Woods and Vice President for Student Services Ron Williams. 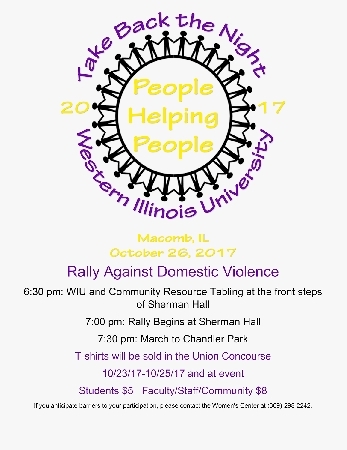 MACOMB, IL -- As part of a campaign of awareness, empowerment and fighting against sexual assault and other forms of gender-based violence, the 28th annual Take Back the Night (TBTN) march and rally will be held Thursday, Oct. 26 at Western Illinois University. A campus and community resource table fair will begin at 6:30 p.m. on the front steps of Sherman Hall, followed by the rally at 7 p.m. and the march to Chandler Park at 7:30 p.m. The rally and march begin on the steps of Sherman Hall and end at Macomb's Chandler Park, where there will be a "Survivor Speak Out." Event T-shirts will be sold in the University Union Concourse from Oct. 23-25 and at the event for $5 for students and $8 for faculty, staff and the community. Take Back the Night is an international event with the mission of ending sexual, relationship and domestic violence in all forms. 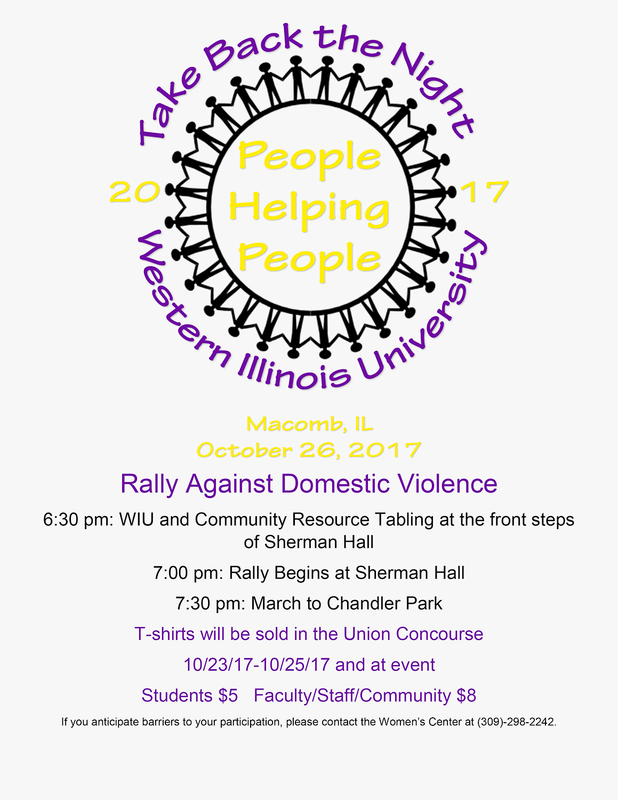 For more information about the rally, call the WIU Women's Center at (309) 298-2242.